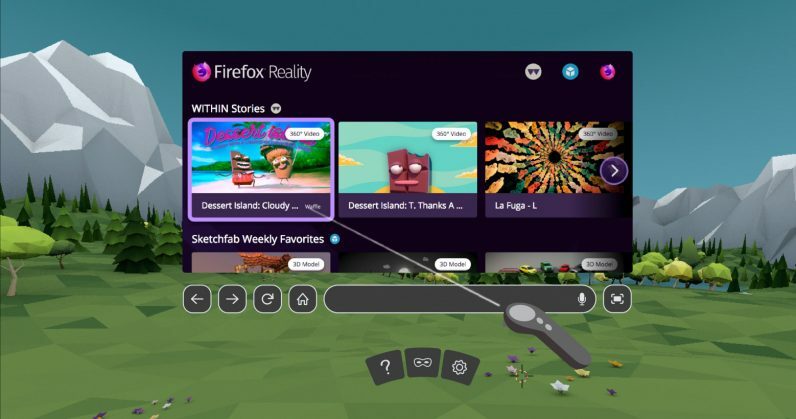 Mozilla has launched Firefox Reality, a web browser custom built for use with VR headsets. Version 1.0 is now available for free in Viveport, Oculus, and Daydream app stores. The goal with this project, which the organization has been working on for years, is to make it easy to enjoy 2D and immersive content on the web as easily as possible. To that end, it supports web search using the mic on your headset so as to negate the need for typing; it also showcases VR games and experiences available online, right on the home screen for easy access. Mozilla’s been bullish on the immersive web for a while now: It previously created the WebVR standard back in 2014 to help developers craft virtual reality experiences on the web. Following that, it’s drafted a proposal for WebXR, which will support augmented reality content in browsers. While VR hardware is constantly improving, it’s yet to go mainstream. But it’s good to see that ecosystem is maturing, and the expansion of your choice of browsers is a step in that direction. Mozilla says that it has a long list of features that it intends to add to Firefox Reality soon, including support for bookmarks, 360-degree videos, and multiple user accounts. If you’ve got the necessary hardware, you can try it now by grabbing the app for Oculus and Daydream; it’s also available in the Viveport store, where you’ll need to search for ‘Firefox Reality’ to download it.